We offer the best guitar amplifier simulations on the market. It is a bold statement, but we mean it! We modeled the ultimate amplifiers, and present them to you completely unprocessed, just like in a real studio. They are easy to use, just as straight forward as the originals, and with infinite possibilities when it comes to creating your very own sound. In fact, we don't want you to think of these as plug-ins - they are amps, no more, no less. Only digital. The sound they produce is completely faithful to the sound of the original amps. You won't hear the difference. Just listen! 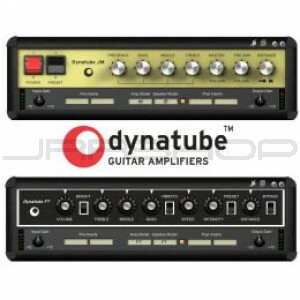 The four amplifier simulations cover the entire spectrum of guitar sounds. The Fender is modeled on the most versatile amplifier in music history, used for genres like blues, soul, jazz, and country music. The Marshall is the classic rock n' roll work horse, an all-round great amp that has set the industry standard for decades. Our Vox is the quirky gem, a rarity producing both the legendary sound of the "British Invasion" pop of the 60's, as well as some truly interesting, characteristic guitar sounds - to say the least. The Mesa/Boogie is the fierce, sonic bulldozer, giving the awesome and uncompromising roaring sound of metal, quite literally. However, we were not content with just simulating the sounds of the amplifiers flawlessly. All four plug-ins are modeled in a complete studio set-up, including speaker cabinets and fully flexible microphone positioning. You get the same possibilities as in a recording studio, only cheaper, more accessible, and without the hassle of actually having to set up all that equipment. *Fender is a trademark of Fender Musical Instruments Corporation. Marshall is a trademark of Marshall Amplification Plc. Vox is a trademark of Korg (UK) Limited. Mesa/Boogie is a trademark of Mesa/Boogie Ltd.
We didn't just simulate the classical, general qualities of the amps. As you know, all individual amps are different, and have little peculiarities of their own. For this reason, the specific amplifiers the plug-ins are based on were selected by our esteemed group of test guitarists and music industry professionals. And they are modeled in full, peculiarities and all! The secret to the astounding quality and superiority in likeness to the originals turned out to be hard work, but the end result is worth it. Everything in the amps was measured, down to the last capacitor and potentiometer, with relentless attention to detail. The result is perfection. Four classic amplifiers modeled in full, scientifically, with mathematical precision, producing a sound which is way above and beyond the digital competition. The idea is that you should get exactly the same sound from the plug-ins as you would get if you had these amplifiers set up in a real studio, with a microphone in front of the cabinet, connected to a recording console. We haven't changed or "fixed" the sound afterwards, because it is not our goal to give you a pre-produced, "ultimate" guitar sound. We only provide you with the tools, the amplifiers, in digital form. Then it's up to you to add compressors, additional EQ's, reverb, or any other effects, to get the sound you think is the ultimate. Running the plug-ins on SCOPE has additional advantages. CreamWare's sample-by-sample technology means that there will be a lot less latency in these plug-ins than in comparable digital products. Dynatube incorporates patented technology licensed by Softube AB, Sweden.